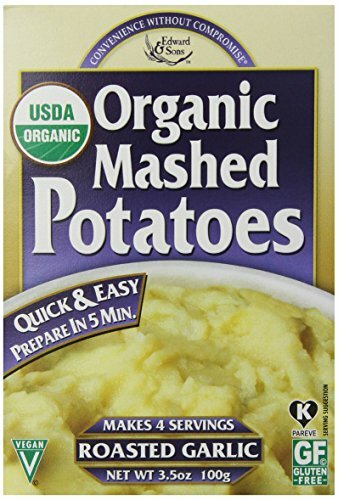 Edward & Sons Home Style Organic Mashed Potatoes are gluten free, vegan and absolutely delicious! They are incredibly easy and quick to prepare. 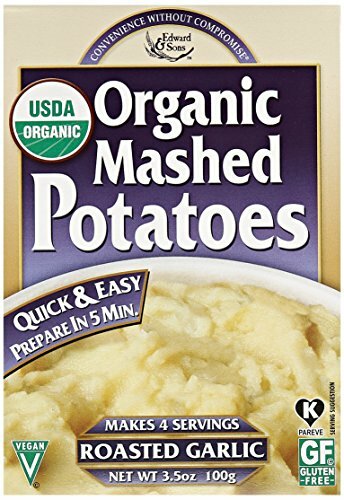 Edward & Sons™ Home Style Organic Mashed Potatoes deliver the rich, comforting taste of fluffy mashed potatoes in about 4 minutes. This is true "convenience without compromise." Edward & Sons Roasted Garlic Organic Mashed Potatoes are gluten free, vegan and absolutely delicious! They are incredibly easy and quick to prepare. Edward & Sons Roasted Garlic Organic Mashed Potatoes deliver the rich, comforting taste of fluffy garlic mashed potatoes in about 4 minutes. This is true "convenience without compromise." Our Organic Mashed Potato flakes with no seasoning. No Artificial Ingredients, Gluten free, Does not Contain Refined Sugar, Vegan, 95%+ Organic. Whip up heavenly mashed potatoes in minutes with these easy-to-prepare mixes from Edward & Sons! 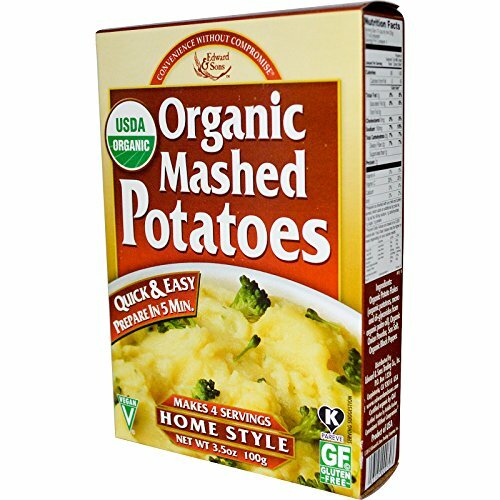 Made from the best certified organic potatoes and spices, these fluffy, smooth mashed potatoes are the perfect side dish for any holiday meal. Don`t forget to top with Road's End Organics savory, quick-cooking gravy! Gluten-free. 3.5 oz. box. Directions: Simply add vegan milk, water, and buttery spread to mix and heat on stovetop or in microwave until desired consistency is achieved. Ingredients: Home Style: Organic potato flakes (organic potatoes, mono and di-glycerides from organic palm oil), organic onion powder, sea salt, organic black pepper. Roasted Garlic: Organic potato flakes (organic potatoes, mono and di-glycerides from organic palm oil), organic onion powder, sea salt, organic roasted garlic, organic black pepper. Chreesy: Organic potato flakes (organic potatoes, mono and di-glycerides from organic palm oil), Cheddar-Style Chreese (Vegetarian Support Nutritional Yeast [yeast, niacin, pyridoxine hydrochloride, riboflavin (vitamin B2), thiamine hydrochloride (vitamin B1), folic acid, vitamin B12], nutritional yeast, organic onion powder, organic garlic powder, sea salt, organic ground mustard seed, annatto powder). 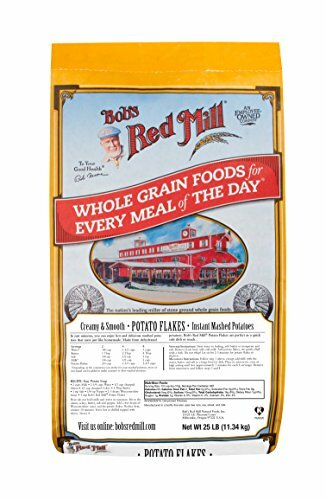 Bob's Red Mill Potato Flakes can save dinner when you're in a pinch! Made from 100% potatoes with no additives or preservatives, these potato flakes are great for whipping up a side dish or potato soup in no time. Prepare on the stove or in the microwave following the simple instructions on the back of the bag. Potato flakes have many other applications as well: use them as breading on fish, chicken, or pork; add to meatloaf or meatballs; use to thicken sauces or gravy; and add to bread recipes calling for instant mashed potatoes. You can use the purple sweet potato in many of the same ways you'd use a regular sweet potato, but the striking purple hue adds a colorful twist to mashed potatoes, home fries, and soups (imagine a gorgeous lavender bisque). Its color is completely natural as it comes from the same pigment that makes cherries and strawberries red/purple. 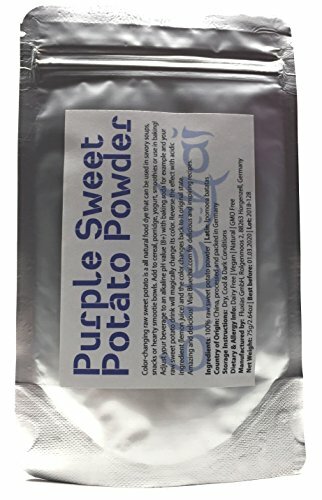 Purple Sweet Potato Powder comes from the root vegetable of the same name and is only distantly related to potatoes. The origin and domestication of sweet potato is though to be either Central or South America. The purple Sweet Potatoes are dried at a low heat to preserve the vitamins, minerals and nutrients. Our Purple Sweet Potato Powder is 100% pure, raw with no added ingredients - Grade A Premium Quality. •A drink made with Purple Sweet Potato Powder can be enjoyed hot or cold •Add to cereal, porridge, yogurt, smoothies or use in baking! •Avoid exposure to direct sunlight, keep in a cool, dry place. •Purple sweet potato or purple yam, continue to gain popularity all over the world. They have been turned into so many interesting dishes like ice cream flavor, chips, paste, just to name a few. 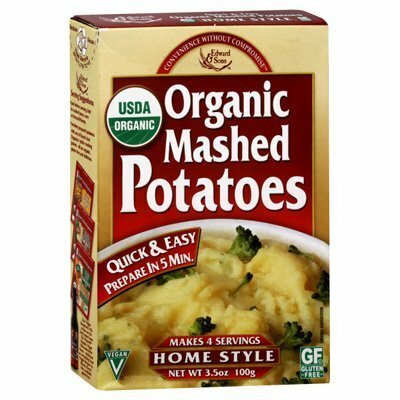 Looking for more Organic Mashed Potatoes similar ideas? Try to explore these searches: Teddy Bear Iron, Shell Topping, and T-Shirt Brown Sign. 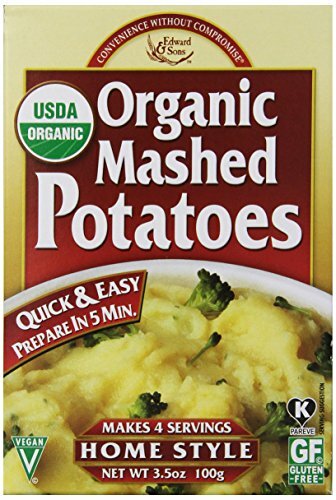 Look at latest related video about Organic Mashed Potatoes. Shopwizion.com is the smartest way for online shopping: compare prices of leading online shops for best deals around the web. 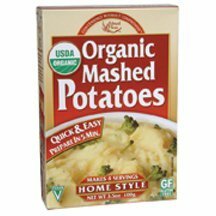 Don't miss TOP Organic Mashed Potatoes deals, updated daily.